Lately Shawn and I have been having trouble at home with Grace's attitude and defiance. Her teacher has noticed it at school as well. Yesterday, as I was pouring my heart (and tears) out to Grace's teacher, she offered that they would pray for Gracie. 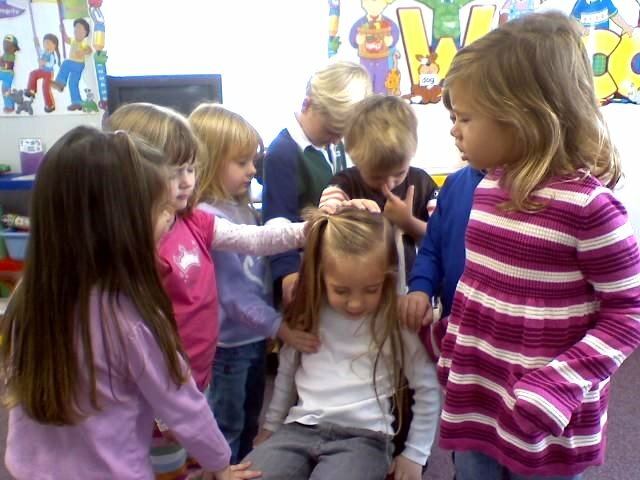 This is Gracie in the Prayer Chair and her sweet little classmates praying for her. I am blessed!!! can I stick Kayli in that prayer chair?? and remember that prayer everytime you look at this sweet photo! What a precious thing to do!! Oh, Lacie! That is a priceless treasure! What a fabulous environment you have her in! seriously...it sounds like her preschool is amazing...and rare!